Since virtually everyone is seeking to get fast, versatile, and easy cooking experience, pressure cooker manufacturers are getting creative by coming up with new appliances that suit the needs of consumers. Electric pressure cookers now feature advanced technology and features that give consumers the best cooking experience in the kitchen. PressurePro, one of the respected brands for making kitchen appliances, are at it again. This time they have brought PressurePro 6 Qt Pressure Cooker. Boasting advanced features and great convenience, this appliance is one of the highest rated cookers on Amazon. To help you make an informed purchase decision, we have compiled a comprehensive PressurePro 6 Qt Pressure Cooker review. 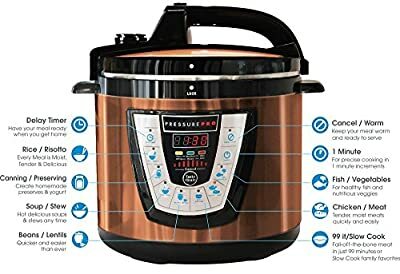 What Makes PressurePro 6 Qt Pressure Cooker Unique? This 6 QT pressure cooker from Pressure Pro can significantly speed up your cooking time thanks to its advanced features. Its unique flavor infusion technology enables it to lock-in nutrients and flavor thereby helping you prepare most delicious meals. It is the perfect appliance for canning vegetables and fruits. This cooker features one-touch preset buttons, digital display, safe lock top with steam release design, and non-stick inner pot that’s dishwasher safe. It also features built-in safety features. With 6-quart capacity inner pot, you can cook generous portions for your family. The PressurePro 6 Qt Pressure Cooker also features unique pre-set options allowing you to cook fish, meat, beans, soup, rice, and vegetables to utter perfection, with a touch of a button. 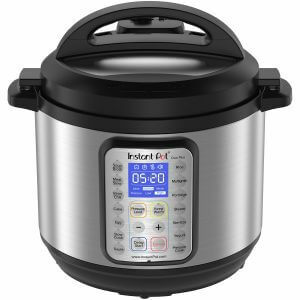 The reason meals prepared with this pressure cooker are delicious is because the steam within forces moisture and liquid back into your food thereby making them flavorful. With a slow cooker function, you can prepare your favorite recipes faster than using a standard slow cooker. This appliance comes in a brushed stainless steel housing that enables it to fit into any modern kitchen décor and is backed by a one year warranty. It has a sleek design and features flavor infusion technology. This technology does not only cook foods better but also make them delicious and flavorful. It features a 6-quart capacity, non-stick inner pot and has easy to read digital timer. The cooker has a solid gripping handle and a manual steam release. This cooker is a great appliance to add to your kitchen. All you need is set all the required functions and leave it to do the cooking job. With its flavor infused technology, you can prepare delicious meals. One of the most outstanding things about this cooker is its cooking diversity and its healthier way of cooking since it enables food to preserve all the essential nutrients. You can cook beef, rice, soups, seafood, beef, canning foods, etc. The PressurePro 6 Qt Pressure Cooker is a handy appliance to have in the kitchen. According to PressurePro, this appliance cooks 70 percent faster than conventional cookers. With one-touch buttons, this appliance is easier to operate. Since it uses less energy than most cookers, one can cut down energy bills while still cooking mouth-watering meals. One thing that makes this cooker unique is that it switches to Keep Warm mode once your cook time is over until you are ready to eat your food. This means you don’t have to worry about your cooked food cooling down or being overcooked. Your food will come out perfectly fine. From this review, it is evident that PressurePro 6 Qt is one of the best pressure cookers on the market. With flavor infusion technology, non-stick 6-quart inner pot, one-touch buttons, and other modern features, this is definitely a handy appliance to have in your kitchen. Besides, it allows you cook a variety of foods and is very affordable.